One of the most critical aspects that make this model a good pick especially for a beginner is its ease of use. The manufacturer has the same model available in various range options, but the one we are going to talk about now has a range of 1,000 yards, something that is quite outstanding in itself seeing how many other rangefinders on the market don’t come even close to this value. To make things clear, the 1,000-yard option has the lowest range in the series, so it can be said that it is the entry level. Any other model, in a different range, you may want to get, will share the same outstanding features and performance. A good idea would be to start by looking at the specs provided by the manufacturer. The range goes from 11 yards to 1,000 yards, and for deer, the range can go as high as 500 yards. You get a maximum angle reading of 60 degrees, plus and minus, which means that you will be able to scan the surroundings with ease. The magnification provided is 6x, which comes in handy at such distances, while the lens diameter for the objective is 22mm. The linear field of view is 315 feet at 1,000 yards, while the angular field of view is six degrees. It can withstand high and low temperatures, between 14F and 131F, and it weighs around 7.7 ounces. Since we’re talking about a rangefinder, let’s focus on its capabilities in this area for a while. The 1,000-yard range is pretty good and gives you plenty of options as a hunter. The device comes with an HDC mode that compensates angles for the distances read to provide you with accurate results. You will find the display easy to use, and navigating through the various options granted is straightforward, as well. The advanced LOS function will allow you to calculate distances with high accuracy. At large distances, the error is plus-minus three yards, so pretty accurate. What matters is that this model also comes with a scan feature. That means that you can follow a moving target and get readings of the distance between you and the target on the go. The display is illuminated and has three brightness settings so that you can adjust it for any conditions possible. Talking about optics, the model comes with fully multi-coated lenses. That means that light transmission is superior and that you get exactly what you need to be able to identify targets at large distances from you. You will be pleased to learn that this particular model is well equipped for severe weather. It is water resistant and fog proof, so there will be no issues to worry about when you’re using your rangefinder in less than ideal weather conditions. Customers who have already tried this model are also impressed with the texturized armor that provides a non-slip grip. The risk of damaging your rangefinder by accident is significantly reduced, and you can count on this model as a durable unit. Seeing how it is lightweight and easy to carry around, the model is an excellent all-around product that you will want to have by your side when out in the wild. Seeing how any piece of hunting equipment can be treated as an investment, it is essential to learn what extras are included with your purchase. While some manufacturers offer just a barebones package that doesn’t add anything else besides the rangefinder, that is not the case this time. The model is sold with a soft carry case that will allow you to keep it in excellent condition when traveling. You will also get a utility clip so that you can mount your rangefinder on a belt, a pocket, or any other surface with flat edges. Keeping your rangefinder close by is easy due to this particular extra. Also, you will receive a neck lanyard in case that’s the preferred way of carrying your rangefinder around. It must be noted that the manufacturer also includes a CR2 battery. 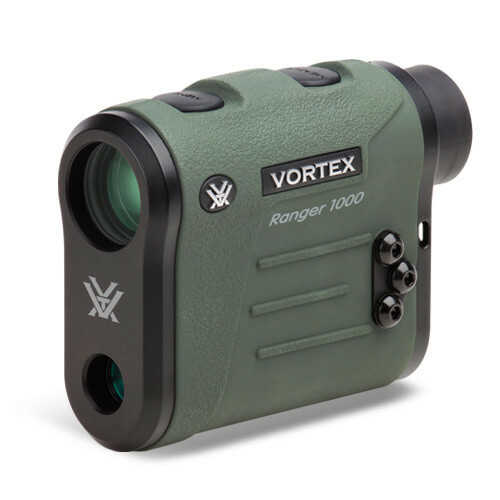 This rangefinder from Vortex Optics comes highly recommended, as a simple look at the specs will tell you that it is superior to many others on the market right now. The long range distance, coupled with the fact that the model also has a scan mode, provides you with the ability to track your prey with ease. Also, you will receive some nice extras with your purchase, and the rangefinder comes ready to use out of the box.